Confined spaces are completely or partially enclosed with restricted means for entry and exit. Typical confined spaces include pipes, columns, tanks and silos. These places are not really intended for humans. In addition to the risk of suffocation, workers have to deal potential explosive, flammable or otherwise poisonous vapors. Ex lighting solutions such as the Atexor tanks sets, need to be carefully configured for confined spaces. Surfaces tend to be corroded and conductive. Taking a normal voltage luminaire into a confined space can be risky. Typically you need low voltage (lower than 50VAC) equipment for confined spaces to avoid the risk of electrocution. 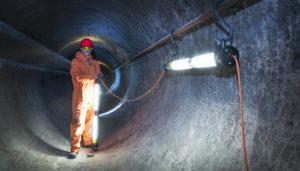 Confined spaces are present in many industries. Even if they don’t have Ex-designated zones, they always present health and safety risks. Not only do you need the right equipment for these spaces. Workers need special training to be able to deal with the hazards and potential emergencies, like sudden lost of air, in confined spaces.